Substantially built with the highly trained, skilled worker in mind. Fall arrest is serious business and the new Panther® Self-Retracting Lifeline is a serious solution to this demanding application. Designed with an integral spring-locking mechanism to pay out and retract the 3/16” galvanized steel cable lifeline. As the worker moves, the Panther secures the worker where a fall from a height might occur. 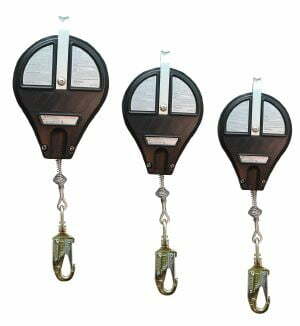 Self-Retracting Lifeline,7 x 19 gauge (5mm) galvanized aircraft cable, aluminum housing, fall indicator, recovery ratio 15.